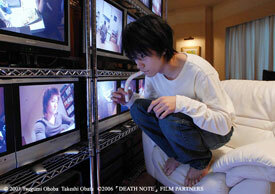 (top) Death Note theatrical poster, (middle) Tatsuya Fujiwara and the CG-created Ryuk, and (bottom) Kenichi Matsuyama. The Skinny: Manga adaptation gets some stuff right, and other stuff not-so-right. Director Shusuke Kaneko gives his imagination a rest, leaving most of the heavy lifting to the original manga creators. Still, this is intriguing stuff - and considering the source material, this may be the best we could ever expect from a live action version of Death Note. Based on a hugely popular Japanese manga (and soon anime), Death Note offers a premise that will likely appeal to disaffected adolescents everywhere. Death Note supposes that human lives are snuffed by "Shinigami", roving ghouls who write human being's names down in a notebook called - not surprisingly - a Death Note. Bored Shinigami Ryuk (a CG creation voiced by Shido Nakamura) leaves his Death Note in a vacant lot because he's curious about the effect a Death Note will have on the human world. 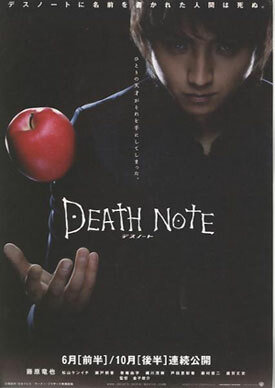 Luckily - or perhaps not - it's picked up by Light Yagami (Tatsuya Fujiwara of Battle Royale), a disenchanted law student who, upon learning just what the Death Note does, decides that the supernatural notebook is his key to bringing real justice to the world. Operating from the anonymity of his bedroom, Light begins a mass-murder crusade that stuns the world, and is eventually given the name "Kira" by his adoring and/or frightened public. Meanwhile, the cops aren't so charitable of Kira's crusade. Though he only offs purported bad guys, Kira's righteousness smacks of an unchecked god complex. Immediately, Interpol is on Kira's tail, led by L, a mysterious detective who communicates with the cops through a laptop speaker. On Japan's side, the Kira case is handled by Souichiro Yagami (Takeshi Kaga AKA Chairman Kaga from Iron Chef! ), a just policeman who just so happens to be Light's father. Souichiro is dedicated and smart, but he's a complete moron next to L, who launches a battle of the wits with Light that threatens to become legendary. With just one or two moves, L establishes that Kira makes his home in Japan. With a couple of extra moves, he begins to deduce just what the rules are for Kira's killing abilities. L is clearly one smart guy, but Light is pretty damn crafty himself. Can Light really beat the local cops, the FBI, Interpol, and L on his way to becoming the world's new God? The idea of a single kid playing God is actually one of the major themes of the popular manga. In the manga, Light is portrayed as a brilliant, affluent kid who's better than his peers - and he knows it. His desire to play God supersedes any notions of morality, and justice is something that Light freely defines. The manga Light cares only about himself, and is willing to sacrifice anyone and everything in the service of his new Utopia, not to mention his massive ego. The movie version of Light makes the character less arrogant, saddling him with a girlfriend named Shiori (Yu Kashii), and linking his desire for justice to the realization that the justice system is flawed. The creation of personal issues for Light makes him much more identifiable and likable than his manga counterpart, though it partially negates some of the source material's most interesting themes. Still, the film version compensates with a few new tweaks to the character, and Tatsuya Fujiwara gives the character an appropriate air of malevolence. Light's power clearly corrupts, but it does so quietly and insidiously, and largely through Light's ego-threatening cat-and-mouse game with L and the law enforcement types who are trying to catch him. L is eventually revealed to be a sweets-loving Goth kid played by Kenichi Matsuyama, whose quirkiness is taken directly from the pages of the manga. Matsuyama apes the character's oddball appearance and behavior perfectly, making it somewhat easy to believe he's really a genius detective. Basically, someone this weird has to be brilliant, otherwise they'd probably be ridiculed like some sort of circus freak. L is easily the manga's most likable character, and Matsuyama goes a long way towards making him likable on film too. Still, L's success as a character is totally due to the manga, and has little to do with director Shusuke Kaneko's vision or handling. Despite deviating occasionally from its source material, Death Note is remarkably faithful to the manga, and does very little to make the manga's exposition-filled pages cinematic. The manga is tough to adapt to film anyway, since it's mainly about Byzantine rules, multi-layered mind games, and lots and lots of explaining. The exact rules of the Death Note need to be explained, as do L's investigations and deductions, Light's scheming (he talks primarily with Ryuk), and general chatter on whether or not this whole mass-murder of criminals thing is really that bad. The themes are interesting, but after a while, the constant talk can weigh the viewer down. One would think the director of the latter-day Gamera films would find some room for physical excitement. No dice. Death Note's excitement is more or less cerebral, meaning it's better to read it than it is to watch it. But even if the manga is better than the movie, Death Note isn't a waste of time. Fans of the manga will undoubtedly be intrigued by the minor differences between manga and movie, and they're probably sold on the premise anyway. Non-fans will have to swallow the straight-faced manga silliness to suspend disbelief - which isn't as easy as it seems. Ryuk, while enjoyably voiced by Shido Nakamura, looks exceptionally fake, and Light and L's characters can be distracting because of their glam bishonen manga looks. Non-fans have to get by the deadpan cheesiness and really listen to get into the film. If they do, they can be rewarded. For all its manga-based silliness, Death Note has an undeniably intriguing premise, and Light's ways of using the note to one-up his pursuers can be fascinating. Basically, the Death Note gives Light the ability to not just kill, but also control before killing, and the elaborate deaths and drawn-out plans that he arranges can be darkly entertaining stuff.